This is an offer made to the male youth of Sri Lanka, who are interested in traditional dance as a career. "Preserve the dance" project was initiated in February 2000. The first batch of students has successfully completed 2 1/2 years of training concluded, including traditional dance, drumming and stage craft. Some of their other achievements are the initiation ceremony "Ves Bendeema" and participation in the ballet "Bera Handa". The next stage of training will be the participation in the "Kohomba Kankariya" a Kandyan dance ritual. Karunaratne Bandara is awaiting the admission of the second batch of students. Students who completed the 2 1/2 year course will receive a certificate with which they could find part-time employment with our dance company, appear as guest artistes in other dance companies, dance rituals/other occasions, and become teachers. Vajira is thankful to the Sunethra Bandaranayake Trust for funding the project 2001. Students will receive a travelling allowance during their training period. Requirements for applicants: Males between the ages of 16 - 30. Height 5ft. 5in. Classes will be held at No. 11, School Lane, Nawala, twice a week during 2 1/2 hours. 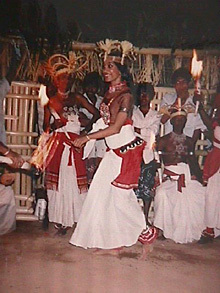 There are three types of dances in Sri Lanka : dances of Kandy (hillcountry), dances of Sabaragamuwa, and dances of the South Coast. Kandyan dances tell a story, but they don't use the "mudra" as in the Indian tradition. The dancer may portray and give life to some mythical animals. Many artists, such as Marta Graham, the mime performer Marceau, and great Russian dancers, have found their inspiration in these dances. Khema de Costa and Upeka de Silva were accompanied, in this recent event, with their old master, one of their best pupils, six drummers, and two village "devil dancers". (00 33) 1 43 74 24 08 / 1 43 74 88 50. Khema and Upekha dance company were performing in Paris at the internationally acclaimed theatre, 'Théâtre du Soleil.' The troupe of 12 dancers and drummers did their performances in Paris at the beginning of March. 'Théâtre du Soleil' is one of France's leading and most popular contemporary theatre groups. "It is a great honour for Sri Lanka to have organised a series of performances by one of Sri Lanka's best dance troupes," a senior Sri Lankan diplomat in Paris said. The performance was titled 'Danses et rituels du Sri Lanka' (Dances and rituals of Sri Lanka). Imagine Shakespeare's Shylock wearing a contemporary costume and using a calculator to count the interest that should come to him from Antonio. This is one scene in the modern version of Shakespeare's "Merchant of Venice" by popular dramatist Bandula Vithanage which will go on the boards today and tomorrow at the Lumbini Theatre, Colombo. This is an experiment to bring this play closer to today's audience, says Bandula who has introduced several changes to the " Merchant of Venice " which is considered one of the best plays of Shakespeare. "Except the text, all other aspects including costumes, mannerisms and actions have been changed to suit present days," Bandula said while explaining that experiments of this nature had also been done in other countries. "They were successful. But this is the first time in Sri Lanka that this kind of experiment is being done." In this experimental task, Bandula has utilised the talents of university students from Colombo, Vidyodaya and Vidyalanka where he teaches drama. Bandula who firmly believes that this play would achieve success states that the structure of the Merchant of Venice is such, it appeals to any audience. The drama also has contemporary significance. "The racial issue (about Jews) and economic concepts still reign in society. Shylocks are still among us." In fact, this drama is being presented after a lapse of over one decade. 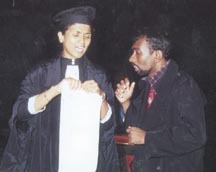 Bandula first presented this drama in the 1980s with popular actor Tony Weerasinghe playing Shylock. "It was a huge success," he recalled. The cast includes Bandula Vithanage, Samantha Gamage, Swethaki Moonasinghe, Sriyani Lunuwila, Sanjaya Naullage, Seneviratne Bandra, Nayana Pradeepika, Prageeth Ekanayake, Diluk Sriyani etc.